Editor’s note: Originally published at tsi-blog.com on September 10, 2018. A few years ago, I wrote a couple of pieces explaining why gold mining is a crappy business. The main reason is the malinvestment that periodically afflicts the industry due to the boom-bust cycle caused by monetary inflation. To recap, when the financial/banking system appears to be in trouble and/or economic confidence is on the decline, the perceived value of equities and corporate bonds decreases and the perceived value of gold-related investments increases. However, gold to the stock and bond markets is like an ant to an elephant, so the aforementioned shift in investment demand results in far more money making its way towards the gold mining industry than can be used efficiently. Geology exacerbates the difficulty of putting the money to work efficiently, in that gold mines typically aren’t as scalable as, for example, base metal mines or oil sands operations. In the same way that the malinvestment fostered by the creation of money out of nothing causes entire economies to progress more slowly than they should or go backwards if the inflation is rapid enough, bad investment decisions fostered by the periodic floods of money towards gold mining have made the industry inefficient. That is, just as the busts that follow the central bank-sponsored economic booms tend to wipe out all or most of the gains made during the booms, the gold mining industry experiences a boom-bust cycle of its own with even worse results. The difference is that the booms in gold mining roughly coincide with the busts in the broad economy. Gold itself is not afflicted by the rampant malinvestment that periodically occurs within the gold mining sector. Regardless of what’s happening in the world, an ounce of gold is always an ounce of gold. It is neither efficient nor inefficient; it just is. A consequence is that gold bullion increases in value relative to gold mining stocks over the long term. 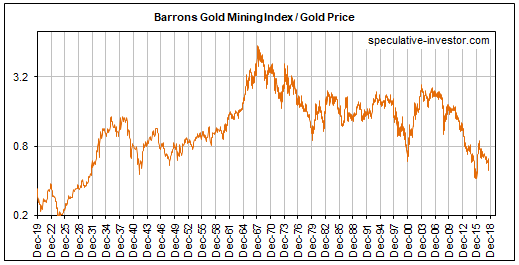 This is evidenced by the fact that the gold mining sector, as represented on the following chart by the Barron’s Gold Mining Index up to 1996 and the HUI thereafter, has been in a downward trend relative to gold bullion since 1968. 1968!! Yes, we are talking about a 50-year downward trend in the value of gold mining stocks relative to gold bullion. For how many more decades will this trend have to continue before analysts stop referring to gold mining stocks as leveraged plays on the metal? There’s no reason to expect the above trend to end while the current monetary system is in place. This doesn’t mean that gold mining stocks should be ignored, as these stocks can generate huge profits for traders who remember to sell when the selling is good. It means that if you want long-term exposure to gold, then you should own gold, not the stocks of companies that mine gold.